Nothing sets the stage for an entry into a beautiful home like a grand staircase. 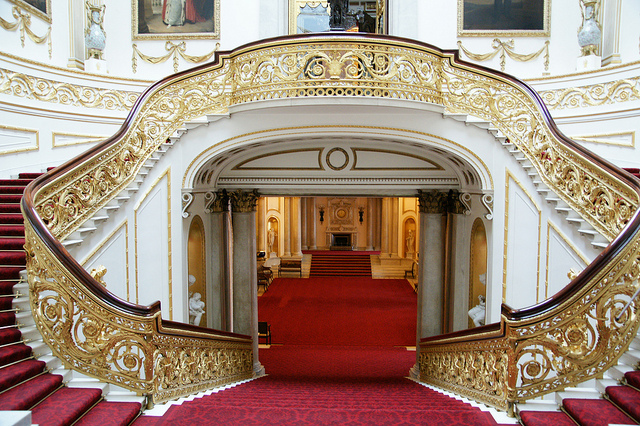 This staircase is in Buckingham Palace and probably a bit more than most of us would like in our homes. Nonetheless, the staircase is stunning and sets the tone for the magnificence of the Palace. 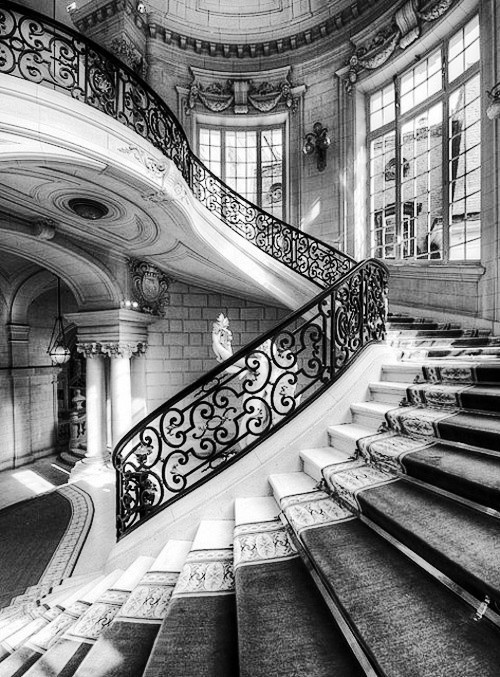 Nothing says “Old World’ glamour like a fabulous staircase. I have always dreamed of having a home with an exquisite stairway. I do not have a grand staircase in my home but fortanately I am currently work on designing a large home with a grand staircase. The stairwell is beautiful as is, however, we plan to have a custom carpet made for the stairwell. I plan to elevate the design a notch or two and create a more elegant feeling when you enter the front door. I am great believer in creating spaces that have a quiet elegance to them. We plan to use the pattern in this strike off for the new stairwell carpet. Please excuse my Iphone picture. The actual carpet is beyond stunning. The carpet will be created by Tai Ping Carpets, the leading manufacturer of hand made carpets. The carpet will be made with a combination of wool and dull silk. 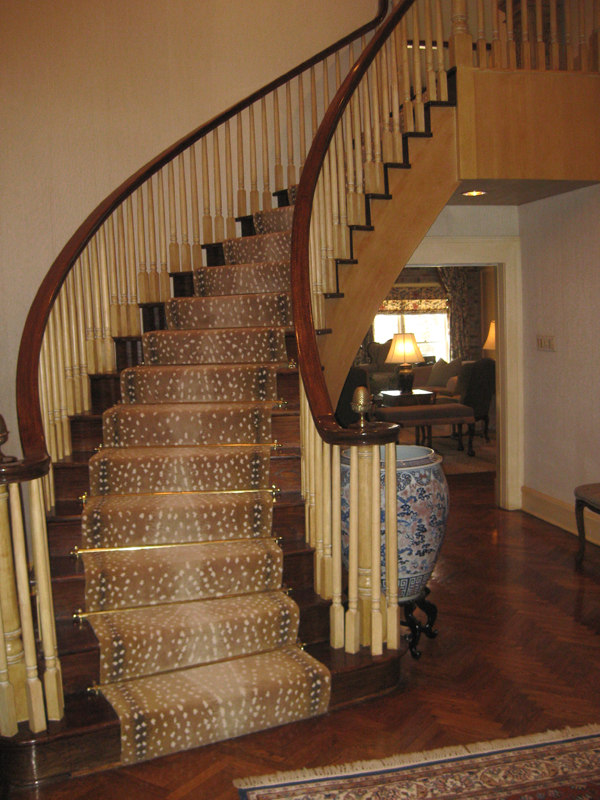 I actually love the pure silk version of this carpet more, however is isn’t practical for a stairwell. 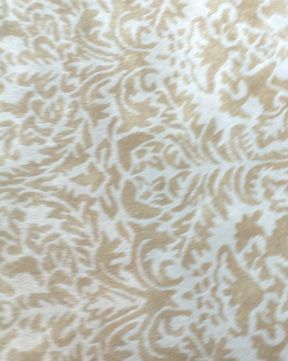 The all silk version is easy to slip on and does not hold up to heavy traffic very well. It is also very expensive. What do you think about the new carpet choice? Do you prefer the existing carpet and the custom carpet? I would love to hear your thoughts! « Welcome Wednesday :: Won’t you join us on the porch? Can’t wait to see the installation picks, Leslie! you have impeccable taste! Thank you for your kind words! I look forward to sharing the final installation pictures. What a treat! I can imagine that it was stunning. Thanks for sharing.